gal-dem’s pop-up bookshop, created in honour of Michelle Obama’s new memoir, Becoming, is the first of its kind. To our knowledge, there has never before been a bookshop which exclusively offers and celebrates books written by women and non-binary people of colour. 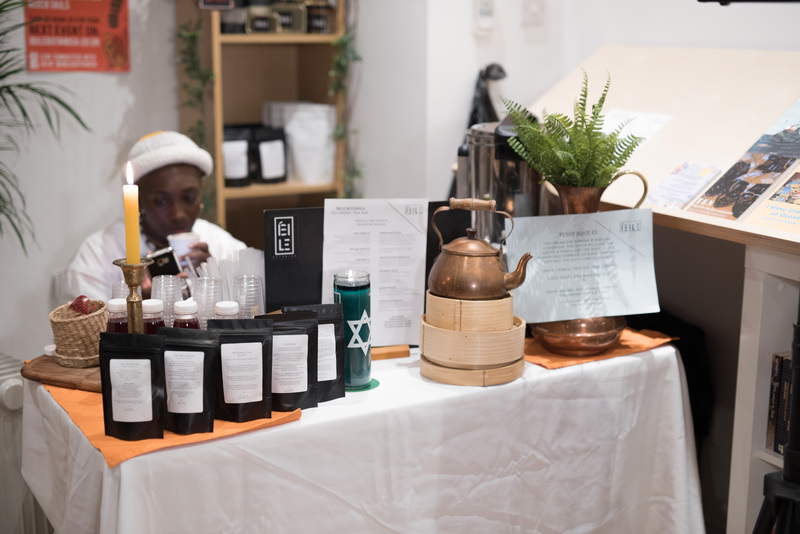 Until Wednesday 28 November, we are serving up tea, cake, plants, and some special rum to our punters – all from businesses helmed by black women. Franky decided to launch her plant shop L’Appartement two years ago with her friend Symmy, after moving to Peckham, South-East London, and struggling to find a plant shop in her area. The stylish pair also offer interior design consultations and plant hire. They are currently working with 50M London to open a plant shop close to Victoria in December. She also says, “there are many projects in discussion for January and spring but we can’t officially announce them yet”. Their affordable plants have helped take the gal-dem x Becoming pop-up to the next level. Plants feel trendy right now, do you think our love for plant-filled environments will continue? I think plants are more than a trend. It’s a lifestyle and it’s here to stay. Plants are a solution for decoration, interior design but also for indoor pollution, mental well-being and a healthy way of living. Especially in the big city, it feels good to bring the outdoors in. Do you take pains to teach people how to look after their plants? We always take time to teach people how to take care of their plants, whether they bought it from us or not. It is very important that people understand plant are living things. By tracing the origin of the plant to the country, continent, and natural habitat, people can actually choose the right plant for them and learn to care for them very easily. What are your favourite plants right now? It is very hard to say… I have many favourites. My latest acquisition is a four-meter giant cocos nucifera. It’s magical! the leaves are like a curtain and the visual impact is awesome. I also bought a euphorbia tirucalli. It’s a pencil cactus with neon pink tips. Pretty crazy plant from Africa. Check it out, you will fall in love!!! Mutulu Oblongata describes her business as her “legacy”. An apothecary specialising in artisanal tea blends which can be used for self-care rituals and powered by “plant spirit medicine”, her drinks are delicious and warming. Blends like Obaa, contain red raspberry, rose petals, hibiscus, lemon balm, red clover, stevia, and she says, “love”. Our very own ‘gal-dem spice’, meanwhile, has fresh crushed berries, black pepper, lime and agave. When did you set up your apothecary? 2014 was the year I decided to fully own who I have become. Mainly through dreams and conversations with myself and my sisters. I would say the root is one of my favourites at the moment because it’s the season to nurture the heart and yourself, and because of the weather and the environment. This is hard as I will now reveal my heart. I sing, dance, clove myself in music and study the Occults. What do you think Michelle Obama would think of your blends? Maame Michelle would appreciate how the blends and brand reflect the joys, triumphs and desolation I have experienced in my life. 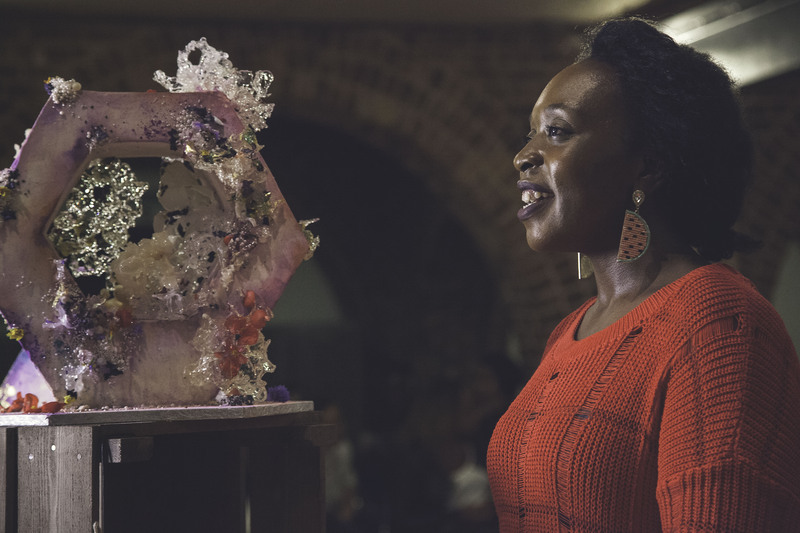 The Indulgent Sugarplum is best known for her work on Extreme Cake Makers, where you can see her whipping up huge tiered cakes, but ex-fashion student Natassja Lusengo says that baking has always been one of her “favourite past times”, even before she launched her business six years ago. For the pop-up she is serving a selection of loaf cakes; scones; and brownies jam-packed with Maltesers, cheesecake and Oreos. She also has Michelle Obama-inspired cake doughnuts called ‘Shelly O’s’, available in all-American and vegan flavours. How do you balance the bespoke creations you make with more ‘humble’ baking? Planning. Primarily our focus is bespoke orders so we always require three weeks minimum. This gives us time to provide humble bakes at our walk-in cafe. Have you managed to keep the joy and passion for your craft? I don’t look at my occupation as a job, it’s my creative outlet. A cake isn’t just a cake for us, it’s art. We make each cake individually, so they’re never the same. Each cake has its own character, style and flair. Therefore, it’s an edible piece of art. What’s a creation that you’ve dreamt up but are yet to make? Currently, I love creating cakes with holes in them and free-floating hanging gravity-defying cakes. I want to create some sort of hanging cake with a hole in it – abstract, and defying all sorts of gravity. So something crazy, to get people asking HOW?! Michelle Mcintosh (gal-dem’s Liv Little’s mum) has been upholstering furniture for three years. 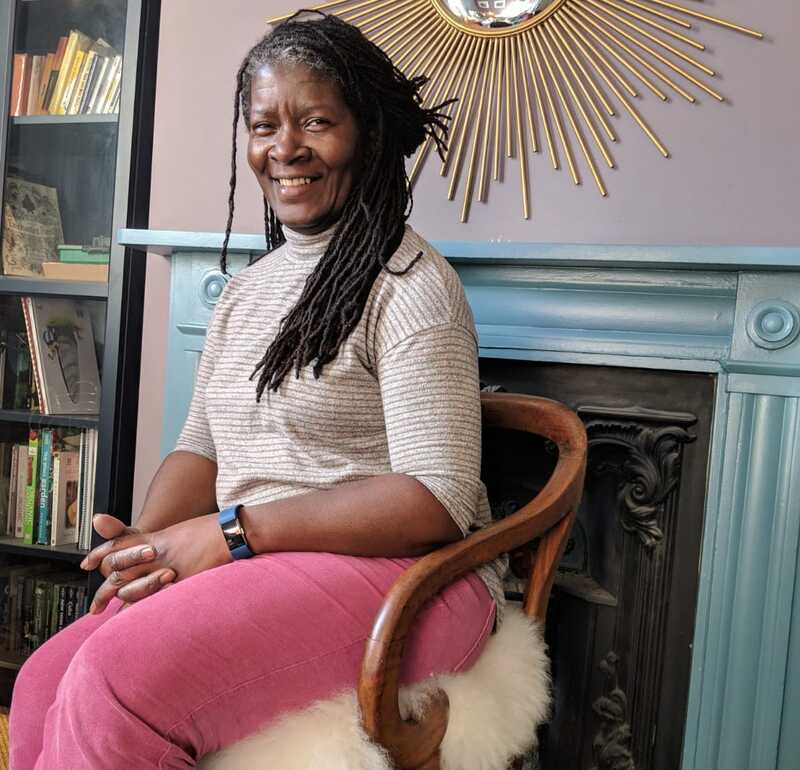 Moving away from her work in business consultancy in the charity sector, her new business, Mcintosh Chairs, has combined her love for sustainability and aesthetic beauty. Using a mixture of eye-catching velvet and luxurious wool, her latest designs are on offer at the gal-dem x Becoming pop-up, starting from £150. When did you start upholstering and what does it mean to you? I just love beautiful objects. And I wanted an ethical business which I think: old furniture, rather than brand new furniture. It’s got that sustainability behind it. And they’re just beautiful! There’s a lot of character and charm in old chairs. My fabric is sourced from a range of different places but the very boisterous or big fluffy chairs were sourced on the Isle of Skye. They’re genuine, 100% sheepskin, with some ethics behind them because on Skye they’re waste material. It’s being treated well and made luxurious. I love when you’ve got something old and you give it new life: that’s me. Seeing the beauty in it. There’s also velvet and fabric from Liberty London (because they had gal-dem in the window!). Where do you hope they’ll end up and what do you hope they’ll bring to people’s lives? I think they’ll travel the world. I was thinking about this pop-up bookshop and thinking that old chairs are like a good book. Beautiful, story to tell and worth passing on. I’d love them to be handed down to people as a heritage heirloom. Rather than this throwaway culture we have. Pass it along if you found it beautiful. Pass it along. Someone could make it beautiful again. According to CEO Jacine Rutasikwa, the best way to drink Matugga rum is neat, or on the rocks. 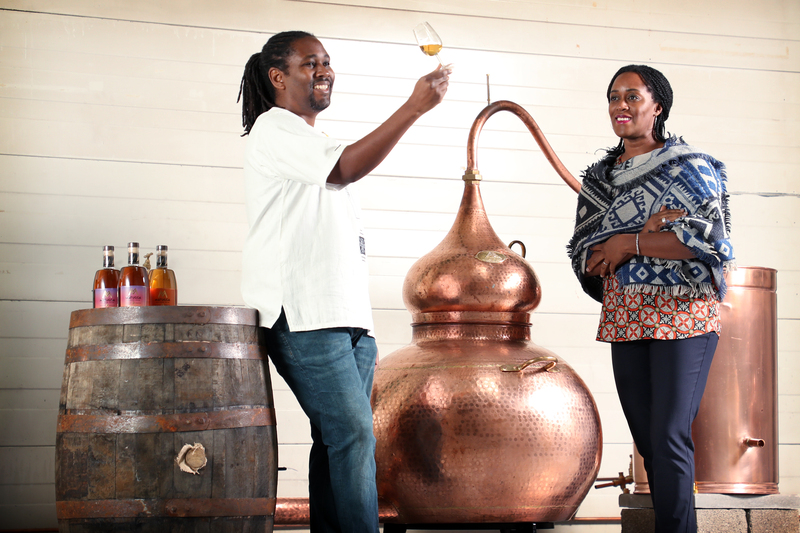 She and her husband Paul set up their business in 2015 and recently moved production from England to their own facility in Scotland through the launch of Matugga Distillers – the first rum distillery in Central Scotland. Matugga Rum is the first to be distilled in the UK from East African sugar cane molasses. To make a gal-dem x Matugga rum punch, mix the spirit with pineapple juice, lime, ginger beer and a dash of cayenne pepper. Where did the name Matugga come from? The inspiration behind our brand is a town called Matugga, situated just north of Kampala, Uganda’s capital city. We have family land in Matugga (historically a sugar cane plantation) where Paul’s late mother was a farmer with a passionate connection to the land. Matugga is a very beautiful and serene place and it’s where we first had the idea to showcase East Africa’s fertile lands and exceptional natural produce by creating artisanal spirits. Why do you use molasses from East Africa? All of our products draw inspiration from our African and Caribbean heritage. Paul was born in Uganda, and my family is from Jamaica. The region produces an abundance of outstanding natural raw materials; sugar cane molasses from East Africa’s rich, red, volcanic clay soils result in the smoky notes that are unique to our rums. Our rums are also crafted through 100% pot still distillation – similar to the rich, full-bodied, aromatic pot still rums from Jamaica. What does it mean to be a black woman business founder operating out of Scotland? As a woman of colour, it’s about African diaspora leadership and representation across all industries, all geographies and all of society. It’s about setting an example to my two young daughters and honouring the toils and legacy of my forebears. Scotland has hundreds of years of distilling expertise and history. We have much to learn from Scotland’s formidable heritage of spirits production in our quest to bring new flavours to the scene, and we’re very happy to be part of the country’s artisan community.